If you’ve been watching Israel’s popular musical reality television show “Rising Star” (“HaKochav Ha’Ba”), it’s obvious why the music industry is so interested in him. Eckhardt sings and plays several instruments, and with blonde hair and blue eyes doesn’t look like he’d be out of place in an Abercrombie & Fitch catalog. Eckhardt easily cruised to the semi-finals by crooning an up-tempo Jason Mraz ballad. What you probably didn’t know was that Eckhardt, who made aliyah last year, honed his musical and singing chops while performing at dozens of NCSY Shabbatons and other events throughout his teen years. For a child growing up in Milwaukee, WI, the Orthodox Union’s international youth movement also served another vital role for Eckhardt, who attended his first Shabbaton as a fifth grader. Eckhardt, the son of an opera singer and a concert pianist, learned how to play the piano from his grandmother, who lived with the family. “She was a live-in teacher, which was awesome,” he said. Other instruments he picked up included violin, guitar and saxophone. Since the local Jewish high school forbade listening to secular music, Eckhardt enrolled in Cooper Yeshiva High School for Boys in Memphis. “They gave me the freedom to express myself through my music, which is what I needed,” he said. In Memphis he met Rabbi Marc Lennon, the head of Memphis NCSY, who introduced him to Jewish music. He also formed a close relationship with Rabbi Micah Greenland, the director of Midwest NCSY who currently serves as the organization’s interim international director. After videos of Eckhardt appeared on YouTube, record labels reached out to him. At first, he didn’t believe the inquiries were legitimate. He learned that they were but realized they probably had him in mind for a pop music boy-band. (He wasn’t too off the mark: The headline of a recent profile of Eckhardt in the Haaretz newspaper declared, “If One Direction had an Orthodox Jewish Member, This is What He Would Look Like.” Don’t be fooled by his good looks though, Eckhardt is a serious musician whose tastes ranges from pop to classical and jazz. He names as his favorite musician the singer Jeff Buckley, who released just one album before his untimely death. After high school, Eckhardt opted to attend Yeshivat Orayta in the Old City of Jerusalem. 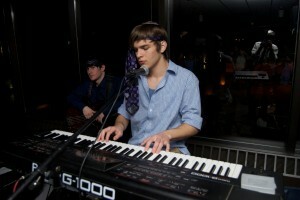 He spent the year engrossed in learning Torah, but made time for music. While busking on Yafo Street he met his future competitors, two other semi- finalists of “Rising Stars”: Aryeh and Gil Gat, two chasidic guitarists whose version of “Song of Silence” has gone viral. By chance, one motza’ei Shabbat, Eckhardt ended up near the bar where “Rising Stars” was doing a first-round of auditions. Several months later he got the callback to appear on the show. Eckhardt’s performance aired last week. Eckhardt was eliminated from the competition on Tuesday night, but win or lose, he’d already made plans to enlist in the Israel Defense Force next year. Wherever he ends up, he credits the Orthodox Union’s NCSY with helping him get there.